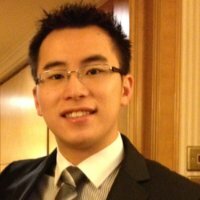 Product Manager - Brand Memory at Samsung Australia, paid us a visit to take us into a deep dive of their SSD (solid state drive) range. 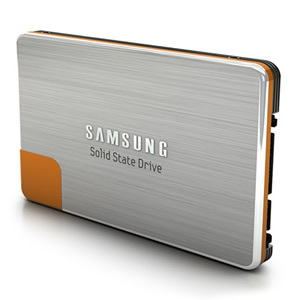 Samsung introduced their consumer range of SSDs with the 470 series in 2010. The series came in three sizes 64 GB, 128 GB, and 250 GB. In 2011, they introduced the 830 series which became the number one seller in several countries. 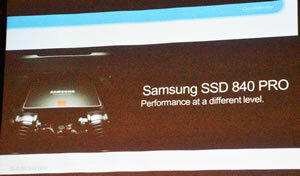 Richard said the 830 series “drove Samsung SSD into the main stream” of SSD development. That success was followed by the 840 series EVO released in 2012. 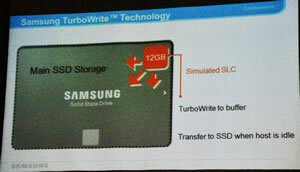 Core of the Samsung innovation in the 840 series was Samsung’s TurboWrite technology. It used a 12 GB part of the drive as a simulated Single Level Cell (SLC), creating a form of read/write cache which would then write to the permanent memory while the disk was idle. 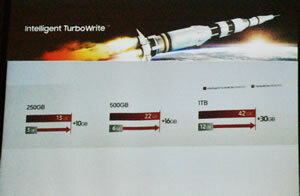 TurboWrite increased the speed of access to the drive dramatically. Richard showed the ad they made with a high-performance car maker to illustrate the speed. 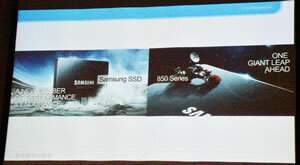 In 2014 Samsung introduced the 850 series. Then in September 2015 came the 950 series. 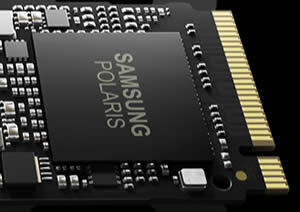 This series saw the first use of Non-Volatile Memory Express memory or NVMe in consumer SSDs. 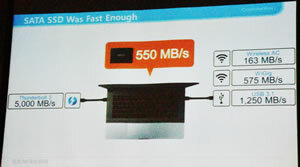 Richard explained that NVMe allows the drive to talk directly to the CPU without going through the CPUs southbridge or I/O controller. To quote Richard “What this means is a much higher bandwidth is available”. 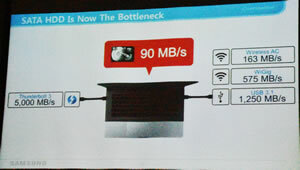 With advances in CPU speed that 90MB soon became the bottleneck. 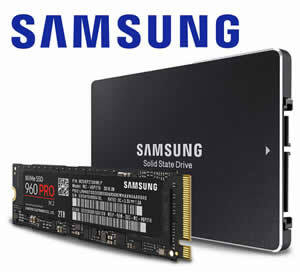 So Samsung introduced the SATA SSD delivering speeds of 550MB/s. 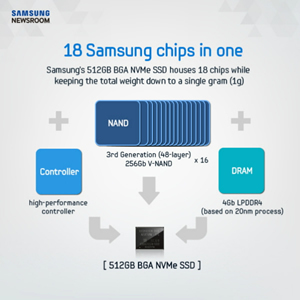 However even that speed became a problem, so with the introduction of the new 960 series Samsung looked at NVMe to enhance the chip’s performance. 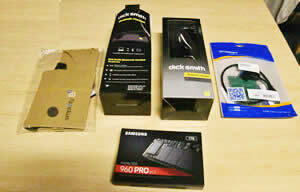 Which delivered a 4000 MB/s performance boost. 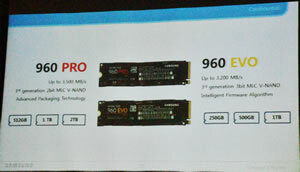 The new 960 Pro can deliver up to 3500 MB/s, that’s bytes, not bits, per second making it one of the fastest SSDs on the market. 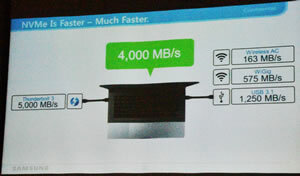 Richard pointed out the EVO was not far behind at 3200 MB/s. created “significant processing power for the SSD” and the new NVMe technology allowed an increasing in the TurboWrite performance by increasing the available cache. Heat dispersion is always a problem and it gets significantly worst as the size of the chip decreases. Samsung have come up with a unique solution. A heat spreading label. Its a thin 1mm layer of copper on the back of the label. And to control it Samsung has its own firmware. To complete the development Samsung also produced their own drivers. This press release gives an indication of how data is processed in the chip. t.
This diagram is taken from the press release. 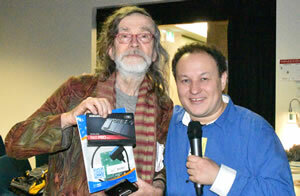 Richard then took a deep dive into the Samsung memory technology to explain just how innovative the 960 series was. 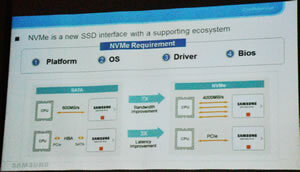 Richard showed how Samsung brought together the V-Nand structure with the new NVMe memory access controls. 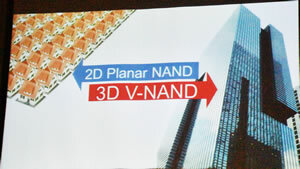 Samsung had introduced the V-Nand structure in the 850 series. 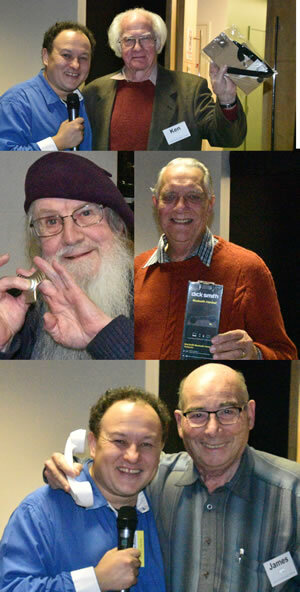 We started with a brief history of memory capacity. 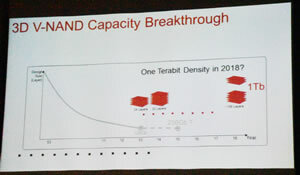 In the 1990s a 1 GB capacity sat in a 120 Nano Metre (NM) space, by 2013 a 64 GB capacity would sit in a 1 NM space. 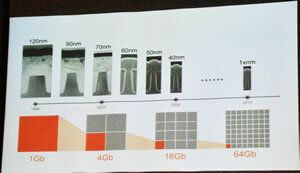 This decrease in size created a problem of data corruption. The problem with such a tight space is data starts to bleed across the tiny gaps. 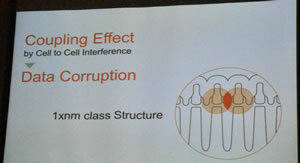 Samsung’s solution was found in mobile phone construction and how it layered memory to create a 3D model. Richard likened it to the “moving from houses (2D) to apartments (3D)“. 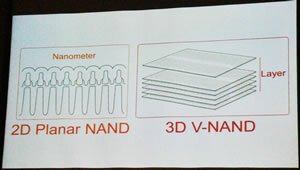 That third generation V-Nand chip technology can has given the Samsung SSD a chip with 48 layers, in 16 stacks giving 768 layers in total, all within a 1 mm space. 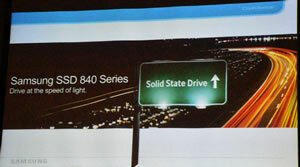 These chips are available in the 950 and 960 series SSDs. 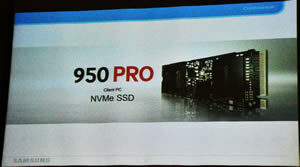 Using this layer technology, the 960 series can deliver a 2 TB size. 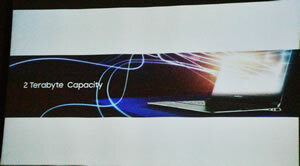 Samsung is looking to continue this development and as more layers are added the chip capacity will increase.